The Kathryn “Panda” Bradley store closed this week. We may have another run depending on how things went. I may buy a bunch and sell them myself. I’m excited to get my own t-shirts and start wearing them. I would have been wearing some but the few that we have are either too small or way too big. My trainer Rosey and I have become friends over this time that she has been working with me. We were talking about Kathryn and how tiny she was and she wants to see a picture. I’m going to share her Senior Prom picture with her. She looks so adorable. I made the dress that is hot pink and short. She tried it on so many times as I made adjustments. Of course there wasn’t a pattern that was her size so adjustments had to be made. I was always afraid that I wouldn’t get it right but Kathryn was always so positive that it would be perfect. Every time I made something for her she had no doubts that it would be just what she wanted. I also made her date a tie to match her sash. The tie was harder than the dress. 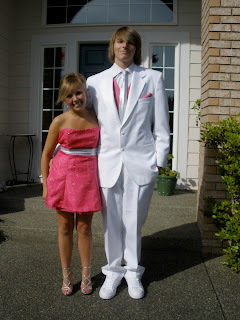 I’ve shared this prom picture with you so you can see what I am talking about. And those shoes had to be ordered. It is so hard to find tiny high heels. When we talked about her cancer I said that it gave us so many good things. She said it is so good that you can find the positive in this. Kathryn’s death was the ultimate low in my life but I know that I will see her again and I know that she believed that she had a wonderful life. She seemed so fearless. My students and I were talking and death came up and I said that I wasn’t afraid to die. At that very moment in time I honestly could say and could really feel it in my heart and soul that I had no fear of death. I don’t think I ever had that feeling before. Death is just the beginning. I took pictures for our school yearbook at the volleyball game this week. I was sitting there just snapping away when this older man asked me if I had a daughter out there. I told him that I was a teacher taking pictures for the yearbook. He talked to me the whole time. Of course he asked if I had children. Of course Kathryn’s death came up. I don’t mind sharing because I always get to share about what a wonderful girl she was too. That always makes me feel good. He also asked how my son was doing. I said, "He is real quiet about it." I almost started to cry. Kathryn wanted us all to go to a counselor before she died. Richard and I both went and saw her counselor. I knew Richard wasn't impressed and neither was I. Later on this same woman let Kathryn down too. I don't think Richard will ever seek help from a counselor. I did and the one I saw was very good. I truly believed she helped me get through a rough spot. The second day I saw Rosey this week she shared with me that her son (2 years old) has eczema so bad that he has lost hair where he scratches and he leaves a pile of dead skin in his car seat when she takes him out of it. She had tried everything. She had taken him to 3 doctors through the clinic that they go to. She has read about it and talked with other Mom’s in the same situation on the Internet. The poor girl. Her eyes were welling up as we talked. I told her she really needed to see a dermatologist. She said she couldn’t get in for weeks. They haven’t been sleeping at night as the little guy wakes up crying. She sent me a text Friday while I was at school that she didn’t sleep all night but they got an appointment for 2:15 that day. They were given 5 prescriptions. I sure hope something works for the little guy. Thursday night I was tutoring a young lady and I noticed her lime green finger nail polish. I had done Kathryn’s nails for her in the hospital. She had picked out a lime green. Kathryn had long beautiful nails. She kept them looking great all of the time. I tried to keep this up for her. She and I were talking about our nails one time and her problem was that her nails grew too fast. She had to cut them all the time. My problem, well, not the same. My nails peel off, crack and don’t grow very fast. Kathryn had nails like her two Great Grandmas. My Grandma Peggy and Scott’s Grandma Hildar. Both were our Father’s Mothers. I had to take off the polish on a couple of Kathryn’s fingers for the oxygen monitor. The guys at the mortuary repainted them nicely for her viewing. I also painted her tiny little toes just a few days before she passed. Sparkly Blue – polish from her cousin Emily. Scott and I have been spending our evenings out on the front porch watching the sun change the color of the sky. We talk and share about our days. It’s been really nice. Our lives are taking on a new life and it feels good. We are becoming the couple that we were at one time. There has been so much junk in our lives that it is nice to have peace once again. Thursday marked on of those days. I had stopped thinking about the time as it just goes too fast. I’ve been trying to just remember the good times that I had with Kathryn. Every day there is a memory to behold and every day I think about her. But Scott said something like it was another Thursday. I knew just what he meant. Kathryn passed on a Thursday. It wasn’t just a Thursday I said. It was also the 2nd. Kathryn passed on Thursday the 2nd of February. This last Thursday, May 2nd, made it One year and 3 months. It just doesn’t seem right. I think about life all of the time. Scott was talking about cars that we have had and ones that his track buddies have. He had been to the track on Friday and was telling me about the people and the cars. He said something about Richard and the RSA. Richard drove at the track one day in our RS America (a Porsche) and on his way home he didn’t make the turn as he hit gravel and slid into a stop sign. He didn’t know what to do. He called and Scott just tolda him to head home. Oh my goodness. The state patrol pulled him over down the road a few miles and gave him all kinds of garbage. He had long hair at the time and was driving a fast sporty racecar. The patrol told him he was on drugs and went on and on and gave him a few tickets. He won’t even let Richard drive home. We had to drive out and get him and the car. It’s something we laugh at because it was so ridiculous and it was all thrown out in court. But I was thinking that Richard has had a pretty good life. Both of my kids have had a good life. We had done a lot of things as a family. They have had many experiences that other children will never have. They have been well loved and taken care of yet taught to take care of themselves. They were given independence and they were able to spread their wings and fly in their own direction. With the guidance we gave early on they were able to make good choices. Do I sound proud? Well, I am. My kids are my greatest accomplishment in my life. I’m so proud of the people they have become. They both have the spirit! The I can do anything spirit. Richard has learned to handle things so calmly and just rolls with it. He has a hard quarter of school right now. He is extremely busy with some work that really isn’t up his alley. But he will get it done. 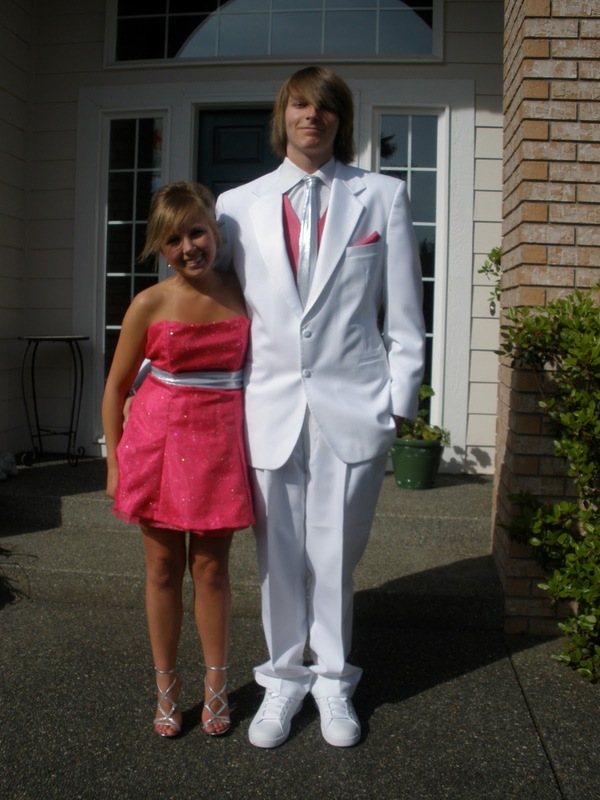 He was also chosen to work at a high school in Bellingham next year for his student teaching. He is excited about this. Next weekend is Mother’s Day. My dear son called me a week ago and invited me up to Bellingham for Mother’s Day Brunch or Lunch. My Mom will be going too. It will be a nice day. Bee’s Mom will be there too. Richard and Bee will be cooking for us. They are great in the kitchen. Scott was invited down to Bend Oregon for a Hawaiian Luau. You may not know this famous surfer Jerry Lopez but he is the one putting this on. Scott is going because his friend Russell was invited. Russell has Parkinson’s and Scott wanted to make sure Russell was able to go so he will be helping Russell get around. Scott will also be happy to see all of these guys that he use to surf with. A surf club reunion! That’s all folks – Have a fabulous Day and enjoy this Beautiful weather.